Leopards, top predators of the African savannah, are known to feed on a variety of prey species. These include smaller and medium-sized mammals such as impala, gemsbok, kudus and warthogs, but they also target relatively small "appetizers" such as hares. It is not well understood whether they specialise in certain prey animals, or which factors might influence prey preferences. Christian Voigt and his colleagues from the Leibniz Institute for Zoo and Wildlife Research (Leibniz-IZW) in Berlin investigated these questions by studying the diet of leopards on commercial farmland in central Namibia. Leopards avoid humans, and it is difficult to observe them when catching prey. The team of scientists, therefore, chose an indirect method. They measured the composition of stable isotopes of carbon and nitrogen in leopard whiskers. The tissue of prey animals consists of specific isotopes of an element that is characteristic for that prey species. Once leopards consumed their prey, the isotope composition of the prey is assimilated into the leopard's body, including their whiskers, according to the relative abundance in the overall diet. This allows conclusions about the main diet of each leopard and the variety of items it might have consumed. While the leopards were sedated to facilitate GPS collaring and examination of their health, the researchers cut off one whisker from each of the 18 adult female and 18 male animals. Back in the laboratory, the hair was then cut into five-millimeter segments and analyzed on stable isotope ratios. As the whiskers of leopards grow at a rate of approximately 0.65 millimeters per day, each segment therefore corresponds to a period of approximately eight days. The eight to 10 centimeter-long whiskers allowed the scientists to look back on approximately 150 days of the "feeding history" of each animal. Voigt, the lead author of the study, and his colleagues identified prey groups with similar isotopic composition based on the ratio of the rare and common stable isotopes of the elements carbon and nitrogen (δ13C and δ15N). "The females used a significantly wider isotope food niche than males," explains Voigt, head of the stable isotope laboratory at Leibniz-IZW. The scientists suggest that one of the reasons for this result lies in the size differences between the sexes. Female leopards, at 34 kilograms on average, are substantially smaller and weigh less than their male counterparts at up to 58 kilograms. Females need less energy owing to their lower body weight, but are also restricted in their movements when rearing young cubs, which they do on their own. "The females cannot specialize in certain prey species because the abundance of these prey species would decrease over time and access to them would become more difficult in their restricted home range when rearing cubs. They therefore need to feed on a wider range of smaller prey species," says Jörg Melzheimer, ecologist at the Leibniz-IZW and initiator of the study. The males, on the contrary, have large home ranges, thus more options and specialize on a relatively small number of prey species. In central Namibia, leopards are currently spreading and increase in numbers on commercial farmland. At the same time, the local population of cheetahs is apparently declining. "Whether there is a correlation between these two trends is currently unknown. However, it is known that lions, spotted hyenas and also leopards sometimes chase cheetahs away when encountered or even kill them," explains Bettina Wachter, lead scientist of the cheetah research project of the Leibniz-IZW. The current study is based on a previous study of the cheetah research project. "In cheetahs, we also documented a high specialization in certain prey groups, but no difference in the diet between the sexes," Voigt explains. Unlike leopards, cheetah females are quite similar in body size to males. 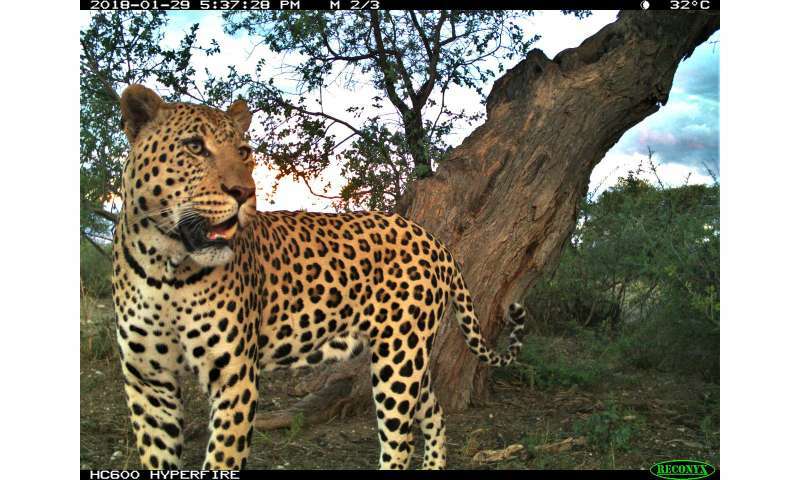 The expansion of leopards in central Namibia might lead to new conflicts with local farmers. They are likely to hunt these charismatic big cats if they lose excessive numbers of livestock. Therefore, it is important to be aware of the diet of leopards and to develop solutions for potential conflicts in close cooperation with farmers.